1957 - Vintage signed document, eight pages, 8.5 x 11, on onion skin paper, August 20, 1957. Acting as an executive on behalf of Sinatra's company Eton Productions, Sinatra employs Frank Ross as producer for the film "Kings Go Forth", offering Ross a compensation of $6,250 per working week. 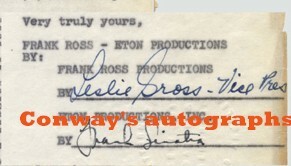 Nicely signed by Sinatra, along with Ross, on the final page in black ink. Well preserved and in overall fine condition. A piece of Hollywood & Sinatra history! 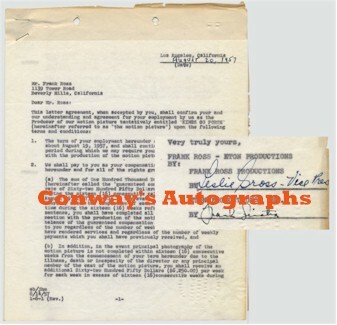 Note: "Conway's Autograph" logo is NOT on originals, but only to detract image theft.